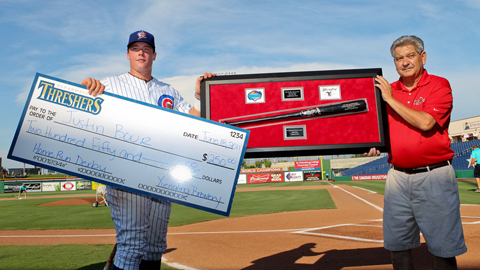 CLEARWATER, Fla. -- Justin Bour had been in a Home Run Derby once before, but that was a long time ago. "I think I was 9 or 10," the Daytona Cubs slugger said. Bour won that one though, he remembered. Now he's 2-for-2. The Cubs prospect passed Dunedin's Brad Glenn with just one out remaining, claiming the Home Run Derby at the Florida State League All-Star Game on Saturday night at Bright House Field. Bour's winning blast was a towering drive that sailed over the right-field foul pole. "I was sure that it was a home run," he said. "I knew it wasn't going to hook foul." Bour, who has 16 homers in 66 regular-season games, blasted nine in the final round, besting Glenn's eight. He'd hit nine in the first round to six for Glenn. Six players participated. "He's one of the best power guys around and he showed it on a big stage," said Glenn, who has 15 homers in the regular season. "He made it look easy. He hit some bombs." So did Glenn. But the 23-year-old Bour, going second in the final round, knew the total he had to beat and did it in dramatic fashion. "The wind was blowing out, so I thought I'd hit my share," said Bour, who is 6-foot-4 and 260 pounds. I wanted the ball up and in, and that's what I got." Missing from the Home Run Derby was Brevard County's Brock Kjeldgaard, the league leader. Kjeldgaard, who wasn't named to the All-Star Game, has 17 homers, one more than Bour and two more than Glenn. Seven of Kjeldgaard's blasts came after the teams were selected. Harvey scratched: St. Lucie Mets right-hander Matt Harvey had been penciled in by South Division manager Jim Morrison to get the All-Star start. Instead, it was Mets left-hander Darin Gorski who got the call. Harvey, 8-2 with a 2.44 ERA, wasn't available because he is scheduled to be promoted to Double-A Binghamton after making one more start for St. Lucie. He has won four straight decisions, recording 36 strikeouts against only five walks over 23 innings. The Mets selected the former North Carolina pitcher with the seventh overall pick in the 2010 Draft and he made his Minor League debut with St. Lucie this season. He did not allow an earned run until his fifth start and has 88 strikeouts to 22 walks in 70 innings over 13 starts. Proud papa: The timing of the All-Star Game couldn't have worked better for Chicago Cubs broadcaster Bob Brenly. It allowed him to watch his son Mike, a catcher with Daytona, in the midseason classic. "I got lucky," said the elder Brenley, who managed Arizona to the World Series championship in 2001. "I wouldn't have wanted to miss this." With Fox picking up the Cubs game with the Yankees on Saturday and Sunday's game televised on ESPN, Brenly had the two days off. When his son got the word Wednesday that he had been named as a replacement on the North Division roster, Brenley knew where he'd be spending his days off. "We didn't get in from Chicago until about 3 a.m., so I'm a little sleepy," Brenly said. "But this is great." Unfamiliar faces: North manager Luis Soto had his Tampa coaching and training staff with him at the All-Star Game. Otherwise, he had to do a lot of introductions. Tampa was the only team with just one representative -- third baseman Rob Lyerly. Daytona, the North Division first-half champ, had six All-Stars. Dunedin also had six on the North squad. St. Lucie and Charlotte both earned six spots on the South team.